The new Scottish parliament building was unveiled in 2004, some Scots were far from pleased. Some felt that the building's unusual design wasn't so much playful, creative, or forward-looking as embarrassing. "It looks like a baboon cage designed by a demented five-year-old," one told me. Some felt the complex's whimsical design insulted to the Scots' newly-minted representational government, which they'd lacked since 1707. Others, with typical Scottish levity, joked that the building's looks suited its inhabitants and purpose. It's understandable that Edinburgh natives, used to either Georgian pomp or medieval heft, found the Spanish-designed clash of stone, grass, cement, and wood somewhat out of place amid the ancient buildings of Edinburgh's Old Town. Angular slabs of cement echo the nearby crags of Arthur's Seat, Edinburgh's centrally-located hill, and the volcanic upshot of Castle Rock, which pins down the other end of the centuries-old Royal Mile. Pieces of rock embedded in the cement form a mosaic of Scotland's geologic heritage, while occasional bronze plaques quote from Scotland's wealth of bards and poets. The complex's standout feature happen to be what earned the comment about the baboon cages—each Member's office has, in lieu of a window, a sort of window-box shaped like a backwards capital P. According to architect Enric Miralles, these are contemplation spaces, where Members can think and deliberate. I like the term "Think Pods." Inside the Think Pod. A cozy place to scribble through a bit of theory, in my opinion. Image (C)2004 Scottish Parliamentary Corporate Body. 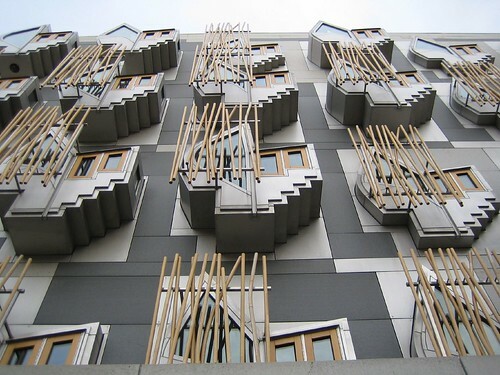 Scots may have ambivalent feelings toward their new Parliament, but I love the idea of a building designed with the inhabitants' intellectual activities, rather than their physical movements, as the top priority. Miralles thought the contemplation spaces would encourage sound reasoning and careful consideration. His ethos echoes another building, this time across the pond, unveiled in 2004 to mixed reactions from the locals—Frank Gehry's Toon-Town-esque Ray and Maria Stata Center for Computer, Information and Intelligence Sciences at MIT. One of the original designs was even called "Orangutang Tree Village." 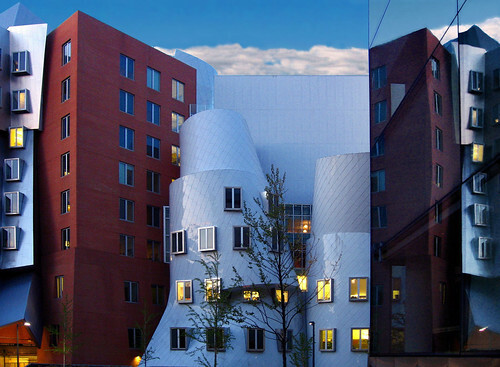 There was a great feature on the Stata Center in Wired in 2004 chronicling the building's conception and construction as a sort of epic battle: the Geeks versus Frank Gehry. MIT's belief that the right building can actually squeeze better ideas from scientists may be a sign that the era of dim, cave-like labs and buildings that seemed to have been ordered pre-fab from a catalog called "Soviet Cement" is nearing its well-deserved end. 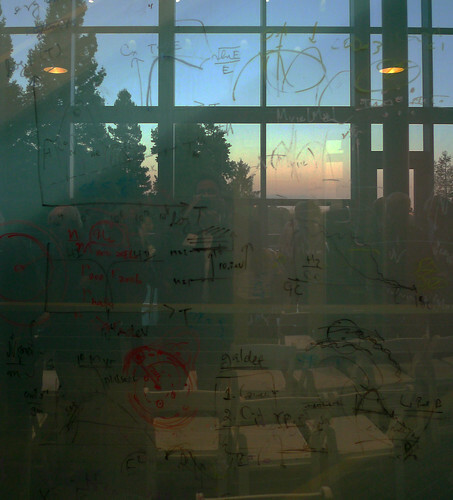 At SLAC National Accelerator Laboratory, the facade of the main building of the Kavli Institute for Particle Astrophysics and Cosmology is a wall of glass. A physicists looking up from a tough equation or away from his computer screen sees sumptuous golden hills, studded with the occasional silhouette of a scrub oak, and the lonely dish of Stanford's radio observatory. 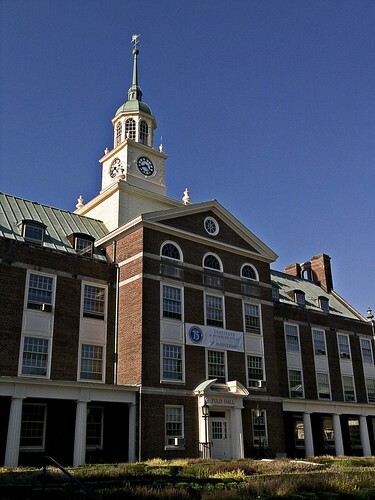 There are no chalkboards, at least not in immediate site—the building's common areas are equipped instead with glass panels and colorful write-and-wipe pens. Scientists often require elaborate laboratories and expensive equipment—laser tables, scanning tunneling microscopes, or even synchrotrons. But for theorists, whom we think of being happy with a pencil, stack of paper, and a garbage can at the three-point line, could architecture and environment be even more influential? Companies and universities try to offer their experimentalists the best facilities money can buy; is the theorists' equivalent an environment that's more think pod than baboon cage? The Institute for Advanced Study at Princeton kicks it old school, the proverbial ivory tower in the flesh. Perhaps unexpectedly, the city of Waterloo, Ontario is emerging as the one of the most exciting places on earth to do theoretical physics. Mike Lazaridus, head of the company that makes the BlackBerry, started the Perimeter Institute from just about nothing. Because there's no affiliation with a university, Perimeter scholars don't trouble with bureaucracy or teaching. From a recent article in Nature News, they sound downright spoiled: the Institute treats them to limos, a sauna, endless pastures of blackboard, plentiful coffee, a complimentary BlackBerry and even free lunch once a week. Eric Hand writes that the director, Neil Turok believes that "you can increase the odds [of a breakthrough] by packing as much talent as possible into a room, and fuelling everyone with free coffee." The institute continues to aggressively raise funding, and recently announced they've acquired enough to double the institute's research space with a 55,000-square-foot expansion called the Stephen Hawking Centre. Perimeter Institute founders razed the local hockey rink and built a theoretical physics Think Pod in its place. In the Perimeter philosophy, architecture and design make a difference. 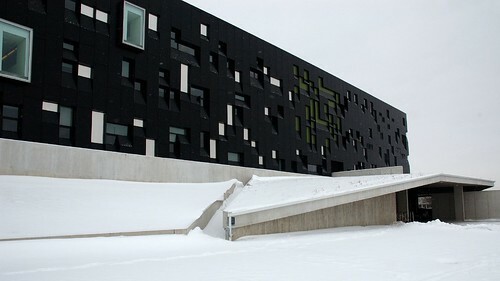 In contrast to the Stata Center's towers and precariously-angled blocks, the Institute favors clean lines, geometric shapes, nature, and lots of black. The main building's atrium is mostly light and space; a virtual tour reveals a grand piano and a few tasteful leather couches. The on-campus eatery, the Black Hole Bistro, is the anti-cafeteria, serving up seared skate wing, lemon creme brulee, and wild mushroom risotto with a side of wine and floor-to-ceiling blackboards. The designers seem determined to catch creativity wherever it may occur—there's even a blackboard outside in the courtyard.